Recycling brochures from the Washington region. 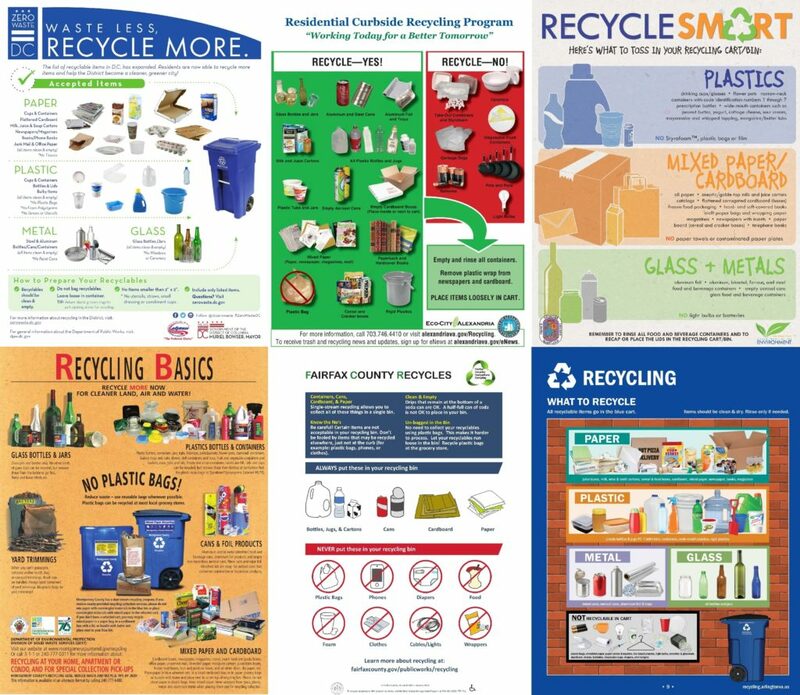 Clockwise from top left: DC Recycling Fact Sheet; City of Alexandria’s Yes/No List, Residential Curbside Recycling Program; Prince George’s County’s Recycle Smart Flyer; Arlington County’s Recycling Yard Waste And Trash Residential Brochure, page 9; Fairfax County Recycling Guide; Montgomery County’s Recycling Basics. Does what you put in the blue bin actually get recycled? As part of WAMU’s “What’s With Washington” series, reporter Jacob Fenston found that most materials do get recycled, but contaminates like food, electronics and plastic bags slow down the system. In addition, some Washington-area counties are sending their glass to landfills because they can’t process it economically. And China, one of the biggest buyers of U.S. scrap material, has introduced stricter policies on recycled material imports, putting a strain on local recycling facilities. What do we know about how our region recycles, and how can we improve? Kojo sits down with Fenston and recycling professionals from Arlington and Montgomery County to talk about how Washingtonians can effectively reduce, reuse and recycle. KOJO NNAMDIWelcome back. Does what you put in the blue bin actually get recycled? For the most part, yes. That's according to WAMU's environment reporter Jacob Fenston, who looked into our region's recycling practices for his latest "What's With Washington" story. But some things, like plastic bags and glass, have been mucking up the system. And decisions made across the globe can impact whether your plastic milk carton makes it to the recycling facility or ends up in a landfill. Joining me in studio is the aforementioned Jacob Fenston. He is WAMU's environment reporter. Jacob, thank you for joining us. NNAMDILet's start from the beginning. How does recycling generally work? What is the path of a cardboard box or an aluminum can from my house to wherever it goes? FENSTONWell, it depends a little bit on exactly where you live, but basically, you know, it gets picked up by your local department of public works or perhaps a private hauler and taken to what's called a MRF, materials recovery facility. And that is basically a huge warehouse where everything's sorted. It's a, you know, sorting center, and there are lots of crazy conveyor belts and machines and all sorts of things that take all this material and sort it out into its different components. And there's also a lot of people in there. You know, there could be dozens of people pulling things that don't belong and sort of manually sorting through as all this stuff rushes past them continually. NNAMDI...at WAMU.org, or kojoshow.org. What did you find out about recycling in the region? How much of what I put into that blue bin actually gets recycled? FENSTONWell, there's a fair amount of skepticism from residents, I discovered. We got a lot of questions from people sort of wondering, you know, does what I put in the bin actually just get sent on the same trash truck and put in the landfill? That's isn't happening. You know, recycling is actually working as it has been designed. There are some problems, though, right now related to sort of the international recycling markets. And so, right now, one of the big problems is contamination within the recycling system. And in our region, about 10 to 20 percent -- anywhere from 10 to 20 percent of what's in the recycling stream is actually not recyclable. And that is a whole lot of problems, and it's made it actually really difficult right now for some places to sell this material. NNAMDIContamination meaning anything in the recycling stream that should not be recycled. A lot of it is the result of the single-stream system. Can you explain why that is, and why most regional counties use a single-stream system in the first place? FENSTONYeah, there's certainly debate about, you know, the pros and cons of a single-stream system versus the various other alternatives. The idea is that it just makes it really easy. You put all your recyclables in one place. You don't have to think about it. You don't have to sort things, and more people will do it. There will be much more participation. The sort of downside and unintended consequences are that a lot more stuff ends up in there that shouldn't be. There's something called wishful recycling, where you sort of hope that you can recycle it. You want to do the right thing, and so you put, you know, your old, you know, jacket or something in the recycling, and it can't be recycled. FENSTONSo, that's one of the unintended consequences of it. But most places, you know, in our region and a lot of places around the country have switched over to single stream. And particularly now with this -- I alluded to international changes in the market, which we'll talk about in a minute -- but it's causing some challenges right now. NNAMDIBefore we talk about that, glass is a special case. What are the issues there? FENSTONYeah, well, glass is heavy, a lot heavier than other recyclable things so it has to be recycled and processed sort of nearby. In the DC region, there aren't a lot of processors to do that and in other parts of the country, that's the same problem. And so another problem is that glass in the single-stream system tends to break, tends to get mixed up with other things. It contaminates the paper, making the paper less valuable. And it's also just hard to get out of that single-stream system when it's these little shards. So, for a lot of places, what happens with glass is that it doesn't get recycled. FENSTONYou know, most places in the DC region, if you're putting a glass bottle in the blue recycling bin, it actually is not going to be recycled. It's going to end up going through the whole system, and then being put in a landfill, in the end. NNAMDIJoining us in studio is Erik Grabowsky. He is the chief of the Solid Waste Bureau for Arlington County's Department of Environmental Services. Erik Grabowsky, thank you for joining us. ERIK GRABOWSKYAnd thank you for inviting me. NNAMDIAlso in studio with us is Adam Ortiz. Adam is the director of Montgomery County's Department of Environmental Protection. Adam, thank you for joining us. ADAM ORTIZThanks for having me, Kojo. NNAMDIErik, as I said, you're the chief of the solid waste bureau in Arlington County. How are Arlington residents supposed to sort and prepare their recycling? GRABOWSKYWe take a lot of time and make a lot of effort to actually educate the population as to what actually can be recycled in our blue recycling cart. So, it really has to do with just educating the population and make sure they're aware that cardboard is a yes, most papers are okay, aluminum metal cans are, plastics, generally, yes. And in our current system, we do accept glass, but we are studying as to whether the county will in fact remove glass at a later date. NNAMDIAdam, how does Montgomery County handle recycling? Do you do anything differently than Arlington County? ORTIZSo, in Montgomery, there's a dual-stream system in which the paper is separated from the comingle materials, and that's glass and plastic. So, there's a long debate, and we might talk about it today, about which system is better. Because of the changes internationally, right now, dual-stream is proving to be a little better. It's a little cleaner. And also in Montgomery, because we have a little more separation, there's less mess and we're able to actually separate the glass a little bit more. So, we're able to get a little more value, even though that market is also a little depressed. NNAMDISo, those are the benefits of the dual-stream recycling system. ORTIZThat's right. The paper's a little cleaner, because it's coming in separately, so we're not getting shards of glass in with the pulpy material. And then, also, we don't have organics so it's not dirty. So, processors are able to buy a better product, so we're able to sell it at a better price and make the operation overall a little more economically buyable than otherwise. NNAMDIAnd, as a I said earlier, these are conversations that are taking place in more homes right now. And here is Suzanne in Silver Spring, Maryland to prove that. Suzanne, you're on the air. Go ahead, please. SUZANNEHi, how are you? I'm passionate about recycling, and my husband thinks that the beer bottle caps can go in the recycle bin, and I thought that they could not. And I'd love to clarify. And if they can't, what can I do with all those beer bottle caps? FENSTONYeah, I would also say, look, depending on where you live, are you in Montgomery County? Check their website. There's a search function, and I think you'll be able to find it. I just actually checked on this this morning. I was looking at plastic bottle caps, not beer bottles, but it depends on -- the guidance will depend on where you are. And I think that, you know, some of them will tell you yes and some of them will tell you no. NNAMDIAdam, Erik, what are the common mistakes that we residents make in terms of recycling? GRABOWSKYGoing back to Jacob's comment about wishful recycling, your jurisdiction will publish a list of what is actually accepted in their recycling stream. And people want to push the envelope, for whatever reason. So, typically, for convenience, people will put their recyclables in a plastic bag, and then put the plastic bag in the recycling cart. Well, that becomes a contaminant, so we would ask that you actually put the recyclables in loose and not put it in a plastic bag, because, again, the plastic bag would just become part of that trash or the contamination. GRABOWSKYWe'd ask people not to put Styrofoam, because it is not recycled. We would ask people to not put in compostable papers, which are the low-grade papers, such as paper towels and napkins and those kinds of tissues. Because, again, they have been recycled multiple times, and really, they're at the end of their recycled life, so to speak. And then, basically, just general trash, food waste, organics. Those things don't belong in your recycling cart. NNAMDIWell, Adam, I, too, have been guilty of wishful or aspirational recycling, (laugh) which I just learned is a thing. Why do you think people generally throw away things that cannot be recycled? ORTIZWell, folks want to do the right thing. There's a lot of consciousness, a lot of awareness that, you know, everyday acts add up on an environmental scale. And people will look at something like a Capri Sun packet, for example, and say, hey, this looks like metal. This looks like aluminum foil. This must be recycling. So, it's not an irrational decision. Really, it's up to the jurisdiction to say, hey, that may seem that way but it's not. It'll end up being thrown out. So, it's well-intentioned, but we have a lot of work to do. And part of the reason we're having this conversation is that this industry is evolving. We're learning. There's changes internationally, and there's changes domestically, and we need to respond and continue to up our game. NNAMDIAnd it does confuse some people. Here's Jose in Washington, DC. Jose, you're on the air. Go ahead, please. JOSEHi. Thank you, Kojo. So, you guys have gone through the points already, but essentially, yeah, the example of someone trying to recycle a jacket, it's a bit farfetched. The real issue is that you have regular items that are plastic and not necessarily recyclable in your jurisdiction, so single-stream recycling makes it much harder. Ideally, the way recycling should work, the pattern should be based on what the actual material is. JOSESo, the plastic has that little number on the bottom, one, two, three, four, five, six, seven. And that actually denotes what material was used to make it, and not what -- where it can be recycled. And, ideally, it should be for the other way. Manufacturers should be forced to stamp -- should be required to stamp the product with a value that identifies how that item should be recycled, and then customers have the appropriate status. NNAMDIAll sounds very, very logical, but how implementable is that? GRABOWSKYSo, we need to evolve. Recycling has been around since the 1990s. We have made some reforms, but overall, the industry's very similar as it is now. So, we, on the government side, we're in charge of cleaning up the detritus of a disposable consumer American society. It's complicated, and we're doing the best we can. We've got some work to do, but producers are part of that equation as well. GRABOWSKYOne of the terms that, you know, we're hearing more and more is extended producer responsibility. For all these products that are made, some of them are going to leak out as litter, and some of them are going to be very difficult for the public sector to process. So, DC, Montgomery and Prince Georges, Kojo, in the last three years have been Styrofoam, for example, or polystyrene, expanded polystyrene, because it was a nuisance material that couldn't be processed in a recyclable way and was a burden. GRABOWSKYBut, you know, as Jose mentioned, there's a lot of other materials that are. Folks are talking about straws. Folks are talking about number six plastics, which are red Solo cups, for example, that seems like it's recyclable, and it's actually not. So, we've got some work to do. And use kind of common sense. It's not rock science. NNAMDIMontgomery County owns its own materials recovery facility, MRF, basically, a recycling facility. What are the benefits of owning your own facility instead of using a contractor, which is what most local counties do? ORTIZYeah, thanks Kojo. Well, there's a number of jurisdictions that own their facilities, because it's believed that it's a public asset. It should be controlled by the public, and then also managed in a way where we're not always extracting value in the bottom line. The overall goal is the environment. So, Montgomery and Prince Georges, where I worked for the last eight years, owns their own facility, so we're able to control our pricing a little bit more. We're able to pick our vendors a little bit more, to make sure that we're really providing environmental and public service, not just a profit. NNAMDIBefore we go to break, I'd like to go to Joy, because Joy is calling all the way from Switzerland. Joy, you're on the air. Go ahead, please. JOYYes. I live in Switzerland now, and I lived in Washington for many years, and I always listen to NPR. I wanted to tell you what we do in Switzerland is not perfect, but it works pretty well. In each little municipality, there's a recycling center. You have bins for that organic stuff. Then you go to oil, vegetable oil and mineral oil. And cans go in another area, and soft metals. Then we go to cartons and paper. What else do we do? Metal, wood and (word?) bottles. Then there's another area where you have electronic items. NNAMDIOh, thank you very much. Thank you very much for sharing that with us. It would appear that we have not yet evolved to that as yet, Jacob Fenston. NNAMDIThat's the thinking that's driving the kitchen right next to the newsroom back here, where we have a variety of things that you can dispose. We've got to take a short break. When we come back, we'll talk about what China has to do with all of this. I'm Kojo Nnamdi. NNAMDIWe're talking about what happens to your recycling, with Adam Ortiz. He is the director of Montgomery County's Department of Environmental Protection. Erik Grabowsky is the chief of the Solid Waste Bureau for Arlington County's Department of Environmental Services. And Jacob Fenston is WAMU's environment reporter who wrote about recycling in a report on "What's With Washington." Jacob, last year, China, the world's biggest buyer of recyclable waste, stopped buying certain paper and plastic materials from the US. Can you explain what happened? FENSTONYeah, so, China had, you know, been snapping up a lot of waste from around the world to use in manufacturing. It's, you know, where a lot of manufacturing happens these days. But there are, you know, some environmental downsides to processing this stuff, and they have been sort of trying to crack down on that for a few years. Last year, they basically banned a bunch of different types of plastic, and also really tightened the limits on contamination in paper and some other things. FENSTONSo, that made it very difficult for a lot of the processors in the United State to sell things to China, and really had a huge impact on the markets for these things. So, I was told, you know, by one person that paper, for example, a ton of paper used to be able to sell for $200. Now, it's like $100 or less, since this China ban went into effect. NNAMDIBut I've got to ask, because I know a lot of people are thinking right now, China? All these years, we've been shipping our recyclable waste literally to the other side of the world? It seems counter to any larger environmental goals. FENSTONIt sure does, and there's probably a better way to do it. And, you know, I think there used to be more domestic paper mills that would recycle paper in the United States. And they sort of went under when China was really buying a lot of this stuff. So, there's probably a better way to do it, but I think, you know, that's sort of the way the global economy works now. A lot of things are made in China, or in Asia, as well. FENSTONBut I also just wanted to mention to you that recycling really still has a lot of environmental benefits. And I think that sometimes we forget about that or get a little bit jaded, because of some of the problems. But, you know, it really can reduce greenhouse gas emissions. If you're worried about climate change, you know, producing paper that's 100 percent recycled takes half as -- or, you know, emits half as many greenhouse gases. So, that's huge. FENSTONYou know, it cuts down on the need for land filling and incinerating, which also emits greenhouse gases. And, you know, of course, you don't have to harvest the virgin material, the trees or the bauxite to make aluminum, or the, you know, petroleum to make plastic. So, there are a lot of real big benefits to recycling. NNAMDISpeaking of the carbon footprint, we got a tweet from Charlotte who says, I think we need single-stream trash removal, generally. Put everything in one bin, haul it away, sort it and recycle it. I also think we should have only one trash service provider. Having multiple trucks from different companies in the same area doubles their carbon footprints. Oh, there are different views, there. Adam, have China's restrictions on imports affected Montgomery County? ORTIZIt has, but, you know, per Jacob's point, it's important to not get caught up on the price today versus the price a couple years ago. It's a dynamic market, and we have to take a system perspective. It's not just about dollars and cents. The total cost is going to be better for the industry. The total cost on the environment is going to be less, if we continue to recycle. But there's a really interesting development, Kojo. ORTIZSo, instead of shipping all this cardboard and paper -- which, by weight, is overwhelming -- across the country, across the planet, you know, we're sending it to mills here. So, mills now are more economically viable than they were, previously. And because they're getting this pulp from the consumer waste stream, it stands to reason there's going to be a pretty positive impact on deforestation, that there's less demand for virgin materials. Because one ton of paper -- which is about the size of a Mini Cooper -- is equal to 17 trees. And we produce a lot of Mini Cooper's worth of paper in this region. NNAMDIErik, has Arlington County also been affected by China's restriction? GRABOWSKYNo. Absolutely, again, as -- it's an international market, and so the reality is we're all impacted as the markets go up and go down, either positively or negatively. And we're in the same boat as the region is, so we've seen -- there's been a big fluctuation of pricing. Two years ago, we were actually making money on recycling, about $10 a ton. And this year, we're actually paying about $17 a ton to have that material managed. So, you can see over two years, there's been about a $27-a-ton difference. So, again, I think we're all feeling it in different ways, but they're similar economic impacts. GRABOWSKYBut, again, the bottom line is about this is really first sustainability and doing the right thing for the right reason. So, we want to make sure that we are looking at recycling as a way to actually make materials sustainable. ORTIZAnd it's also -- I mean, when you say it costs you money, it's also cheaper than the other costs, if you were to landfill it. So, you are saving money that way. NNAMDIOkay. A lot of people want to get in on this conversation. I'll try to get as many in as possible. Here's Tracy in Vienna, Virginia. Tracy, you're on the air. Go ahead, please. TRACYHi. How are you? I'm in Fairfax County, and I have a question regarding things that should be excluded, because I literally go from my mailbox pretty much right to the recycling trash can and just dump a lot of my junk mail. And I'm wondering if the plastic on the envelopes, some of the letters, makes it exclusionary. And also, whether the glossiness or embossment does. ORTIZGood question. I can take that. Yeah, you're good. You're good, Tracy, to continue to do that. And similarly, gable top milk and almond milk, and I know NPR audience, so almond milk and soy milk, those can also be put in the recycling stream, because in the processing, that coating and those plastics are removed. NNAMDIOkay. So, the envelopes that have plastic windows, not a problem. NNAMDIOkay. Erik, when counties send their recyclable materials to MRF, the counties will generally get a rebate. This means that counties generally get paid for recycling. Can you explain how that works? GRABOWSKYYeah, different communities will have different contracts. Again, if you have your own MRF, you're actually managing a different -- for a lot of the jurisdictions in Virginia we actually have contracts with our material recovery facilities. So, we pay what's called a gate rate or tip fee or processing fee. And then what happens is, based on the commodity value -- so, if I take a ton of material, I pay the $72 or the tip fee, and then they basically take that material and break it down. There'll be a percentage of it that's aluminum, a percentage that'll be steel cans, plastic, newspaper, glass, those kinds of things. GRABOWSKYAnd then based on the index prices for those various commodities, we will get, potentially, a rebate. So, aluminum has high value. If it's a greater percentage of that ton, we get more money. So, that's the reason we want to focus on contamination and minimize the amount of contamination. As was said, you know, contamination runs in this region from 10 to 20 percent. So, we want to actually minimize that, which makes the overall value of that ton of material more valuable. In the same -- and that's why people have discussions about glass, is if glass is a zero value commodity, then potentially, again, that distorts the value of that ton. GRABOWSKYSo, what happens is you pay a tip fee, you get a rebate based on the material value. And that ultimately tells you what you either get back in revenue or pay at the end. And that's where I said two years ago, we were getting $10 a ton, and now we're paying $17 a ton. NNAMDIArlington County released a brochure last year called "The Economics of Recycling Right in Arlington County." And I guess you just explained some of the reasons why you issued that brochure. Last fall, Arlington County announced that it may start asking residents to throw glass in the garbage instead of the recycling. Why is that? GRABOWSKYThe county hasn't made a decision as far as glass goes, but again, as I explained earlier, as a glass -- at least for our purposes, our material recovery facility does not recycle the glass. We were putting material in there that was getting no value. And, ultimately, it ends up in the same landfill, or a landfill similar to if we put it and handle it in a different way. If we put it on a trash cart, it also ends up in a landfill, but at a much cheaper rate. So, that was the consideration. That's why we're considering it now, because of the fact that there's no environmental benefit to put it in the blue cart or recycling it, we actually look at the economic impact of the material. NNAMDIHere is Maryann, in Bethesda. Maryann, your turn. MARYANNHi. I just have a couple -- well, one's a comment, and then there are a couple questions. Can you please explain to people the importance of not putting number six? And I'm assuming I'm still correct on that. But when you look at the little triangle on a plastic container, you can see one through seven and you can recycle everything but number six. And if I'm wrong in that, please correct me. NNAMDI(overlapping) I guess that increases above Jacob, Erik's, Adam and my paygrade, but (laugh) one of them might want to respond, anyway. GRABOWSKYMaryann, I can take part of it. I would ask that you actually talk to your local jurisdiction. We all have different requirements as to what's acceptable, and it really is driven by what our material recovery facility will actually accept. So, in some circumstances, certain types of number sixes may be acceptable. In certain circumstances, certain types of number sixes will not be. As far as plastic bags, as I explained earlier, it just becomes a contaminant. So, we don't want plastic bags put in the recycling cart. As you suggested, we should take those back to the grocery stores, and they will be recycled at that point. GRABOWSKYAnd as far as the, you know, bag cost, again, I think every jurisdiction is different legislatively as to what they can or cannot do. And in certain jurisdictions, they have eliminated or charged an additional amount for a plastic bag. They're not doing that yet in the state of Virginia. NNAMDIFairfax has a pilot program with glass-only sites to process glass. Why can't Arlington and other counties send their glass there? GRABOWSKYWell, actually, we're partnering with Fairfax County and Arlington County has two drop-off locations where we have two containers that are glass only. And we've encouraged the county residents to take their glass to those two facilities. We will then take that material to Fairfax County, where we will get that glass actually recycled. So, if you really want to have your glass recycled in Arlington County, the best thing to do is actually take it to one of our two drop-off centers and put it in the glass-only container. NNAMDIWell, we got an email from Paul, who says, while paper recycling is very easy to accomplish, electronic recycling is drastically harder. There was no municipal option that I knew of to recycle e-waste in DC or in Fairfax. And one of the pictures I see in your report, Jacob, was a picture of a keyboard that somebody attempted to recycle. Where do people recycle their electronic equipment? FENSTONI think most jurisdictions have e-waste drop-off options. If you're in DC, Fort Totten, I think it's, like, Saturdays. I don't remember but you can look it up and there are drop-off sites. I don't know exactly what happens after that but it is recycled in some way. NNAMDI(overlapping) I've done Fort Totten, but, as I said, we're running out of time. Adam, you only recently started, as you mentioned, this position in Montgomery County. Prior to that, you held the same position in Prince Georges County. Apparently, the two counties have a pretty big recycling rivalry. Is that correct? NNAMDIAnd they have the two best -- they're supposed to be the two best recycling counties in Maryland based on the percentage of waste that residents recycle, instead of throwing in the trash. How do you plan to get the better of -- how do you plan to overtake Prince Georges County now that you've switched sides? ORTIZWell, I'm trying to avoid metaphors between somebody leaving the Mets to play for the Yankees. There's so much room for growth. One of the things that Prince Georges excelled at, and Jacob covered, was the expansion in organics composting, particularly food. Montgomery County generates a lot, but we don't have a facility there. So, that is where we can make the most gains. About a third of the waste stream that's going into landfills and incinerators, is food. And that has value, Kojo, just like metals and plastic. NNAMDIJust quickly, Mikata wants to know, can we recycle pizza boxes? Can we recycle containers that had oil or fats in them? ORTIZIf it's very lightly soiled, it can. But if it's -- it's a little bit of a judgment call, but if you're not sure, put it in the trash or your compost. NNAMDIAdam Ortiz is the director of Montgomery County's Department of Environmental Protection. Thank you for joining us. NNAMDIErik Grabowsky is the chief of the solid waste bureau for Arlington County's Department of Environmental Services. Erik, thank you for joining us. NNAMDIAnd our own Jacob Fenston. He is WAMU's environment reporter. Jacob, always a pleasure. NNAMDIOur discussion on regional recycling was produced by Cydney Grannan. Our local update on Virginia politics was produced by Ruth Tam. Coming up tomorrow, we'll look into how some Maryland delegates are fighting Governor Hogan's proposed highway expansions. Plus, we'll meet the acting DC public schools chancellor, Lewis Ferebee. After a long history of DCPS scandals, can he steer the district school system? That all starts tomorrow, at noon. Until then, thank you for listening. I'm Kojo Nnamdi.